This cover is currently only available in Japan. But from this post, you can get one right now, anywhere in the world, for free! NO VIRGIN….Material, that is. Re-Case is 100% made from trash. MINIWIZ Sustainable Energy Development is a Taiwanese Architecture and Design firm that thrives on one thing – TRASH. RE-caseTM is the first of a line of products made with MINIWIZ’s pioneering waste composite material, POLLIBER, made with agricultural byproduct and post-consumer thermoplastics. OK, that’s a mouthful. So what is RE-caseTM? It’s a piece of trash. 100% TRASH turned into an iPhone cover. MINIWIZ is the Taiwanese design and architecture team behind many over-achieving eco designs. HYmini, one of MINIWIZ’s first products, is not only a palm-sized wind power generator, it also harvests solar power and manpower via HANDCRANK. The EcoARK (a major attraction at the Taipei International Flora Expo) is a building made entirely out of POLLI-BRICKs, a MINIWIZ engineered 100% recycled PET made building material. It also utilizes solar power to provide for the energy-efficient LED lighting for the entire structure. And while other companies are happy calling 40% recycled material-made products green, MINIWIZ insists on going all the way. Most of their stuff is made from recycled pudding cups, car bumpers, old plastics, and locally-sourced rice husks. This stuff is 100% Made from Trash. If that still doesn’t have you convinced, the Re-Case is also designed to hold an RFID or PayWave card. RE-caseTM’s design was inspired by the Japanese INRŌ. a carrying case for identity seals used in the Edo Period (A.K.A. a long time ago). Instead of a seal, RE-caseTM holds an RFID (radio frequency ID, such as those that let you into your office or the ones you use in the London Underground). This chip sits between the case and the user’s iPhone. Wave your phone, get into your office. It’s like magic (only not). 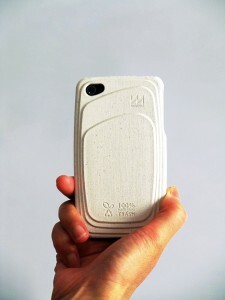 Re-Case is an iPhone case that you would use if you were truly thinking to make something that was sustainably designed. And since POLLIBER is an architectural grade material, your iPhone is protected from any form and level of clumsiness (except maybe the clumsiness of dropping your iPhone into the toilet or the kiddie pool. Your Re-Case will survive that, but your iPhone may not). RE-caseTM is currently available in Japan only. But here’s the AWESOME NEWS! Since you are part of GreenJoyment, you have an opportunity to win a Re-Case for free! “But I don’t have an iPhone,” you might say. But if you win (easy to do), you can give your prize to one of the cool iPhone kids. Maybe they will let you into their “cool iPhone kids” club. Customers interested in RE-caseTM will be able to order it online at Amazon or directly at the MINIWIZ website soon, BUT, since you’ve read this far, you can now participate in a contest to WIN a free Re-Case! Simply click the like button, add us to Google+1, or Tweet about this contest below. Once you click “like” below, (clicking “like” is step 1 of 2), you will get instructions on the page here for how to enter the contest to win your very own Re-Cases. Enter the contest by Tweeting, Liking, or +1(ing) this post. I would re-use old trash to organize my house. Sometimes what is one person’s trash is another person’s treasure. I love items that are repurposed to remade into something that is needed like the phone cases! Too bad it is not made in the US, tho. This will make a great gift for my Daughter. Nice looking wee ‘gadget’ – a lot better and smarter looking than the current covers, and it’s doing a lot of good as well! Iam very much interested in very small rural solar-energy items such as Mobile Phone solar charger, Solar led lamp, solar fan and solar re-chargeable batteries. This is awesome! Environmentally friendly and looks great too!! I would recycle trash to make home building products like composite decks and fences , roofing shingles , driveway asphalt. in addition to recycling… I always like reusing a good wine/champagne/funky liquor bottle as a vase. You can use it as is OR get someone to cut the top off. You can also do many other things with glass bottles such as a lamp, drinking glasses, storage..the list can go on. Plus, at my school, we all have these RFID tags to get in, so this would be perfect! Wow, this is cool! I would love to win this to give it to one of my friends. He has an iPhone 4, but he doesn’t have a case, and he is a busy kid, so it would be a great fit for him! Love to have a nice gift for the missus, trash into treasure…we pick up stuff off the road to use in our home, so far we have a baby cot, furniture, a stroller, reusing trash everyday!!!! i think that everyone can reuse mason jars with lids for hoby and crafter containers and even egg crates can hold such things as nuts and bolts. Make compost and grow organic vegies. Cute, and great concept. I would love one for a friend of mine. the usa need to rethink and do it now. I think along with reusing trash, we need to keep rethinking the word “trash.” We have a 0% waste goal at my workplace, and as soon as you put a few extra bins out – one for compost, one for recycles, and one for “landfill” – you’d be amazed at how little you actually need to throw away. 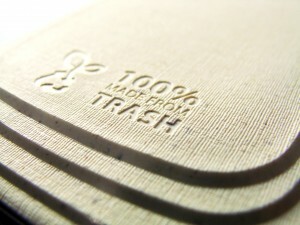 Taking trash and turning it into usefull products wat a cool way to help Mother Nature! with so many of our electrons make of plastics why not reuse plastics to make them. phones, printers, laptops, mice, kitchen trash cans, etc. Recycling and solar powered are two ways I try to help. This iPhone case has showed me alternative ways to using my “trash” I’m excited to try and come up with some interesting uses for my trash! Another way recycled materials end up being useful! Well done ! There seems to be almost endless possibilities for the material you guys are mustering out of this “trash”! I was thinking that another useful thing you could produce is planters. If this material is built to protect an iPhone from anything, than i should defiantly do the job with keeping a plant in place. And whats better than having your greens protected by green? And for some reason i can’t shake the idea of making jump-ropes with this stuff. Anyways, Id love to win this case! P.S I also happen to be eating some chinese food, and making re-useable chop sticks might be something to look into! Another thing is the bottom part of shoe inserts, you know, the plastic part beneath the actual sole or shoe horns. It can practically replace any plastic item! In Micronesia, we use the plastic grocery bags to make handbags. All you need is a knitting needle and a bunch of plastic bags. We also use the tabs from soda cans to make leis. I try to reuse wherever possible! Just a few simple things includes using styrofoam in the bottom of plant pots to help reduce water water loss. Rather than buying new clothes every season my friends and I have regular clothing swaps, which ensures that we have whole new wardrobes for nothing- with minimal waste. There are just too many ways everyday! Do you have any pictures to send that we could post on GreenJoyment?